Huck Norris is the fellow inside your tire to fight off the Bruce Leaks. It also scares off the Snake Bites and Nasty Dents. It’s your buddy to inflate the tubeless tires to give extra kick to the tire when you want to punch it to your rims. 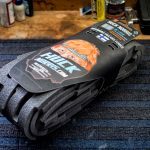 Based on a similar idea to the foam-lined, run-flat tires that have been used in rally car and motorcycle racing, Huck Norris puts a light foam band inside your tire that adds extra security while letting you preserve the better ride quality of thin sidewall tires on even the most technical trails. Huck Norris comes in three sizes. Choose yours by the internal rim width. All Huck Norris sets are sold in pairs, and are delivered with a Face Kick Fender. Huck Norris is delivered in 29″ length. To get 27.5″ version you just cut it shorter. There are marks where to cut. 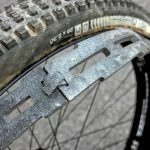 Can also be cut to suit 26″ tires. It is the same product for all wheel sizes. 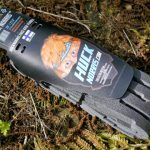 Huck Norris puncture protection is a great system for that bit extra protection when belting it along rough trails. I haven't managed to get a single puncture using Huck Norris, but it doesn't remove the possibility of cutting tires on sharp objects. That being said, the risk of splitting the tire in between the rim and rock is massively reduced. Huck Norris lives up to most of his claims. An efficient way to add tire and rim protection with no added hassle. Huck Norris lives up to most of his claims. An efficient way to add tire and rim protection with no added hassle. Why The People's Champ? Simple. Ease of use, protects the rim well, it's the lightest of the inserts, and it's also the cheapest. The Huck Norris is the most user-friendly of all the systems. 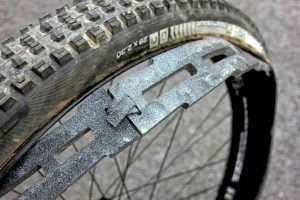 Trailside repairs are no different than a standard tubeless setup, and your bike will handle nearly the same as a standard tubeless setup. Plus, you get some added rim and tire protection to boot, all while costing less than half of some of the competition. Why The People's Champ? Simple. Ease of use, protects the rim well, it's the lightest of the inserts, and it's also the cheapest. If you want an afternoon project you might be able to DIY something like this, but if you want something that just works, Huck Norris does. 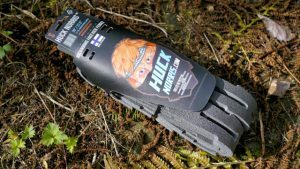 A more expensive, more complicated alternative might be worth looking into if you don’t change tyres much, but Huck Norris is a really serviceable solution, and is ideal protection for compulsive tyre swappers. 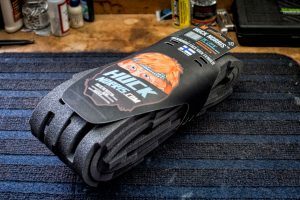 Huck Norris is a really serviceable solution, and is ideal protection for compulsive tyre swappers. Consumers – Visit our store finder page to locate your nearest Huck Norris stockist. Follow VeloBrands on your favorite social networks.